A good mix tape is more than a collection of music; it’s a mood unto itself. Whether you want a pick-me-up or a down-and-out vibe, the right batch of songs can take you there. Nowadays, MP3 playlists have taken the place of audio cassettes, but the spirit of a mix tape remains much the same. 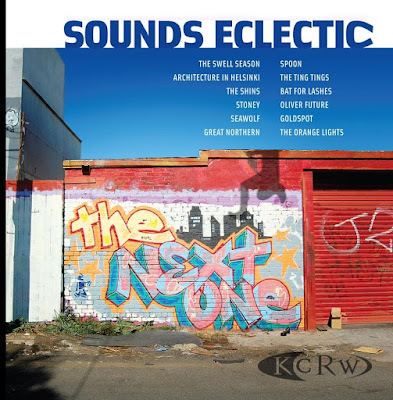 That spirit runs through KCRW Sounds Eclectic: The Next One, a new various-artist compilation released by the eminent California-based radio station. Twelve performances—all recorded live during Morning Becomes Eclectic, hosted by Nic Harcourt—amount to a smorgasbord of imaginative, at times truly magnetic music. Given the live setting, the artists demonstrate how well their songs hold up without the production enhancements afforded by a studio album. Some songs aren’t as aesthetically brazen or progressive but still resonate with creative depth. Orange Lights impart a catharsis of climbing chords and empathetic lyrics with “Life Is Still Beautiful” while Swell Season summon a poignant rendition of “Falling Slowly,” which garnered the duo (Glen Hansard and Marketa Irglova) this year’s Academy Award for Best Original Song for the film, Once. As well, Seawolf cruise through “You’re A Wolf” to an eerie guitar riff nuanced by deft tempo changes and vocalist Alex Brown Church’s low and steady delivery. All in all, KCRW Sounds Eclectic: The Next One makes for an impressive compilation, essentially a mix tape for listeners who appreciate ingenuity and aesthetic in music.